LibreCAD, a 2D CAD drawing tool has reached version 1.0 more than a year of work. 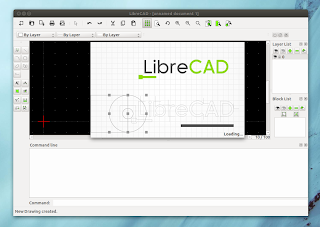 LibreCAD, previously known as CADuntu, works natively on Mac OSX, Windows and Linux and is based on the community edition of QCad. Among the changes between QCad Community Edition and LibreCAD are: up to date Qt4 based user interface (QCAD Community Edition uses Qt3), plug-in system, autosaving and better reading of DXF files. Also, QCAD Community Edition is officially only available for Linux (and QCAD itself is cross-platform, but it's not free), while LibreCAD is cross-platform. With this release, LibreCAD is finally considered stable, but it still needs a lot of work, so don't expect it to compete with professional applications like AutoCAD. Further more, LibreCAD doesn't come with documentation - it initially included QCAD's documentation but it had to be removed because it wasn't published under GPL. Also, the application doesn't support .dwg files yet. There was some work on this, but it hasn't been implemented because of some license issues with LibreDWG.